Now that school is out I'm back to "normal" working hours at home. I was telling Edgar last night how this makes me excited...yes, excited...to get up and start to work in the morning. I'm one lucky girl. Wheeeeee! 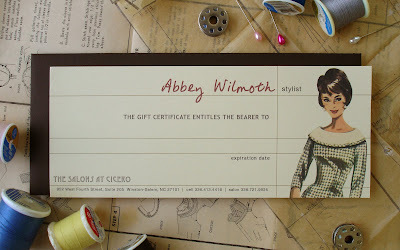 Here's a gift certificate to go along with Abbey's business card. Hope you enjoy! Love the gift certificate as well! I wouldn't want to spend it -- i would want to pin it on my wall. Amazing how a neat business card and a neat gift certificate affect the quality of the business. Sassy! Wonderful work! I really appreciate this elegant identity for the salon you created, the business card and the gift certificate. You could also implement this language to other objects such as posters, catalogs, bags, bundles, and so on... just to give the best support to that identity. Nice work, congrats :). 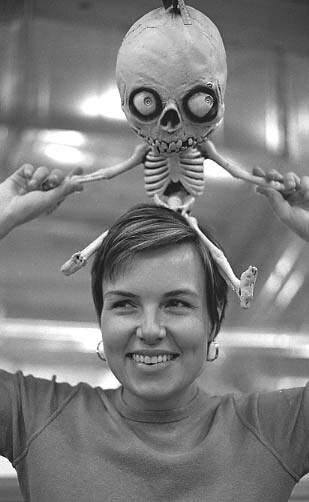 This may very well be my most favorite picture of your work! way to go!!!! I LOVE the assembly of items...totally fits the mood yet doesnt over power your work! wow! Love the layout. Did you do the drawings on both... or are they vintage? Julie- I wish I could take credit for the drawings...but, sadly I can't. They are both vintage.